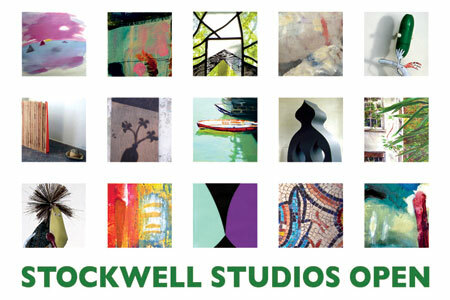 Stockwell Studios participated in the Lambeth Country Show this year – 19th and 20th July in Brockwell Park. 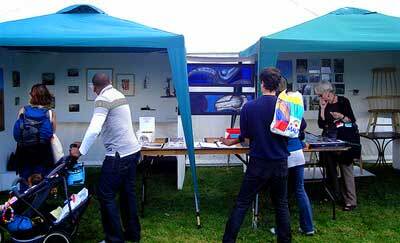 Our stand was in the Charities and Communities section. Many of our artists exhibited work, alongside documentation of outreach projects and the Annie McCall archives. Photographs were displayed capturing the unique atmosphere of the building and garden. Thank you to all those who showed support. We were well attended! Private Eye included Stockwell Studios in its ‘Nooks and Crannies’ feature of the October 2007 edition. These articles serve to highlight the plight of old buildings often allowed to deteriorate before being demolished to make way for new build. Mentioned is the earlier plan to use the hospital for social housing and the re-housing of Stockwell Studios’ artists after a survey that considered the building to be sound. 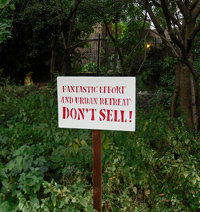 An article titled “Art hub doomed?” appeared in the South London Press on 31 August 2007 highighting the plight of Stockwell Studios’ current home of the former Annie McCall Hospital, which if sold by Lambeth Council to developers and their plans approved, will face demolition. Heloise Brown of the Victorian Society said “it’s a credit to the council that they have allowed such a valuable resourse to thrive for the last 20 years. We hope they don’t abandon it now”. A council spokesman said plans for the site included space for artists as well as community facilities and a green area. Stained glass artists Kathy Shaw and Tim Cunliffe are showing new work in their exhibition ‘Dark illumine’ at the Cochrane Theatre Gallery in Holborn until December 2007. The exhibition is inspired by Milton’s ‘Paradise Lost’, which interestingly connects with some lost paradises in Stockwell. 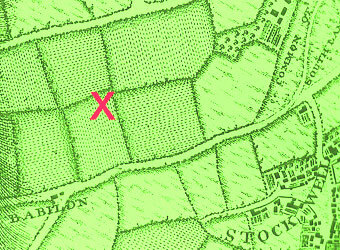 Research on local history has revealed that the site of the studios is referred to in a map of 1598 as ‘Seven acres called paradise’, and in a later map there is mention of a Paradise Farm. 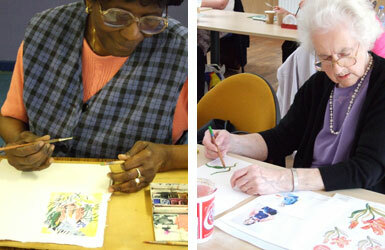 Another successfull year at the Resource Centre and Ashmole Community Hall for May’s drawing and painting classes. Some of the work done by local senior residents will be on display at Tate South Lambeth Library in October later this year. Classes are on holiday until mid-Sept hopefully we can all return to both venues in the new academic year pending support and funding. If you would like to know more about May’s popular class please email m40anderson@btinternet.com. Stockwell Studios was the venue for this year’s INURA conference party (www.inura07.org.uk). INURA (International Network for Urban Research and Action) is a network of people involved in action and research in localities and cities. The Network consists of activists and researchers from community and environmental groups, universities, and local administrations, who wish to share experiences and to participate in common research. We were fortunate to have the opportunity to share this experience and gain some insight, knowledge and find solutions which may help Stockwell Studios work towards securing the success of an agreed artist lead urban cultural development project. Café in the garden throughout the weekend. 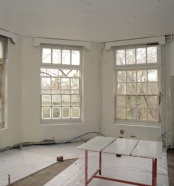 Stockwell Studios opened the doors of the old Annie McCall Maternity Hospital to welcome close to 900 visitors for three days of art, music, performance and installation. This was an opportunity for the entire family to not only visit the building and garden but to see behind the closed doors of the artists’ workplaces. 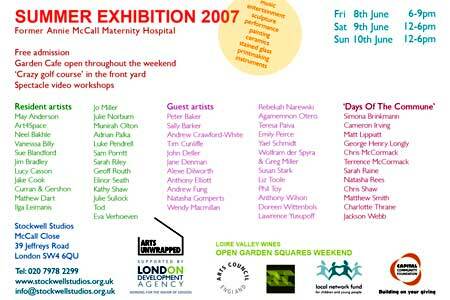 To coincide with the Open Studios, we took part for the first time in theOpen Garden Squares weekend. 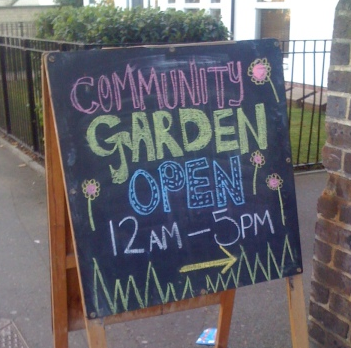 This is the one weekend in the year when many of London’s private gardens open their gates to welcome visitors. We also participated in Arts Unwrapped, the London-wide artists open studio event which is supported by the London Development Agency. List of all artists below. Bureau of Silly Ideas throughout the weekend. Featured at our successful Summer Open Studios was a crazy golf course created out of scrap, with the theme of futuristic buildings for Stockwell Studios. It was a recycled community arts project involving more than 40 youngsters from the local community. There were five courses, taking two weeks to construct prior to the show. 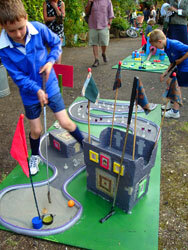 During the show the young people managed the crazy golf handing out clubs and instructions to visitors who wanted to have a go. It was a busy activity and kept everyone amused for hours! The courses have now been dismantled and the main buildings are displayed in our front courtyard rockery for all to enjoy. This was an Art4Space commission and funding secured by the Local Network Fund. Please visit www.art4space.co.uk for further documentation. Stockwell Studios were delighted to have acclaimed poet Chris Tutton perform his work for visitors in our wild garden during our recent show. More info about Chris, whose workshops and performances also featured in Lambeth Readers and Writers festival in May 2007, can be found at www.christutton.co.uk.